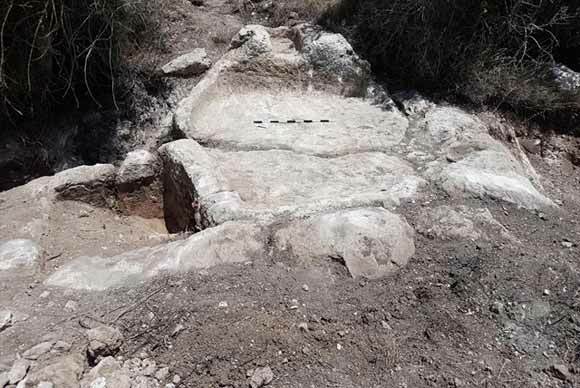 In June 2017, a salvage excavation was conducted at Newe Shalom (Permit No. A-8012; map ref. 197934–68/636356–4972) preceding the expansion of the settlement. 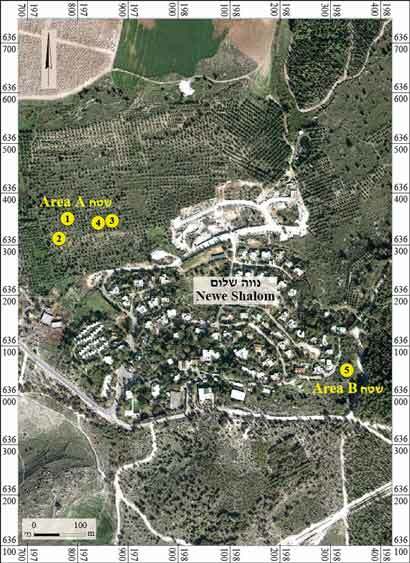 The excavation, undertaken on behalf of the Israel Antiquities Authority and financed by the Newe Shalom community, was directed by M. Balila, with the assistance of N. Nehama (administration), M. Kahan (surveying and drafting), and Y. Zelinger (scientific consultation). Prior to the excavation, probes were cut with mechanical equipment, yielding rock-hewn installations and agricultural terrace walls. The excavation was conducted in two areas, c. 0.5 km apart (Fig. 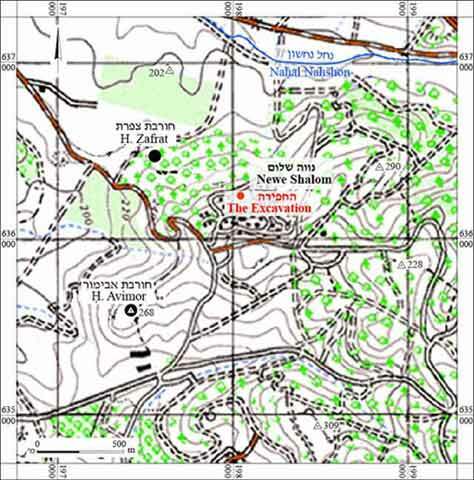 2): in the northern part of the settlement (Area A) and in its southeastern part (Area B). 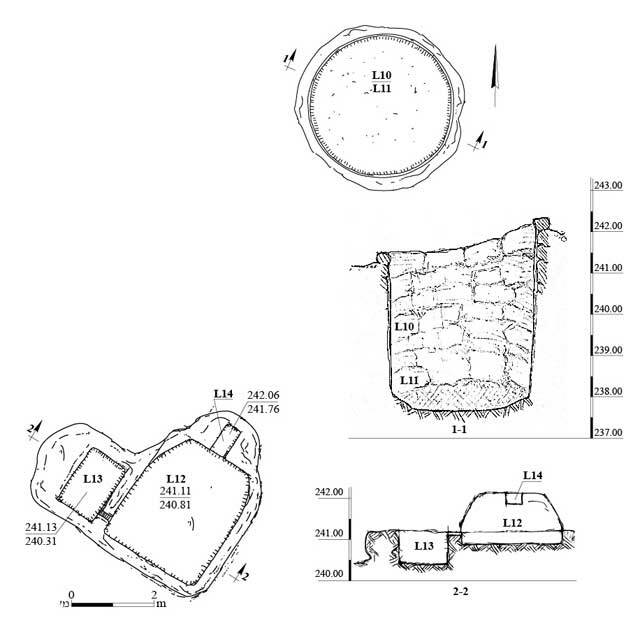 The excavation yielded several rock-hewn installations: a limekiln, winepresses and a cupmark. Several excavations have been conducted near these areas in recent years: northeast of Area A, a multi-room building from the Intermediate Bronze Age was exposed (Storchan 2013), and the remains of a building complex with a mosaic floor dating from the Byzantine period (sixth–seventh centuries CE) were discovered to the east of Area B (Solimany 2012). Area A (Fig. 3). A round limekiln (diam. c. 5 m, depth 4.5 m), whose lower part was cut into the bedrock and upper part was stone-built (L10; Fig. 4), was unearthed. Its northern half was destroyed due to modern construction work. The kiln’s ventilation channel was not found either, probably due to damage during this construction as well. Based on its resemblance to kilns discovered in the nearby area, the kiln was dated to the Ottoman period (Storchan 2012a; Storchan 2012b). 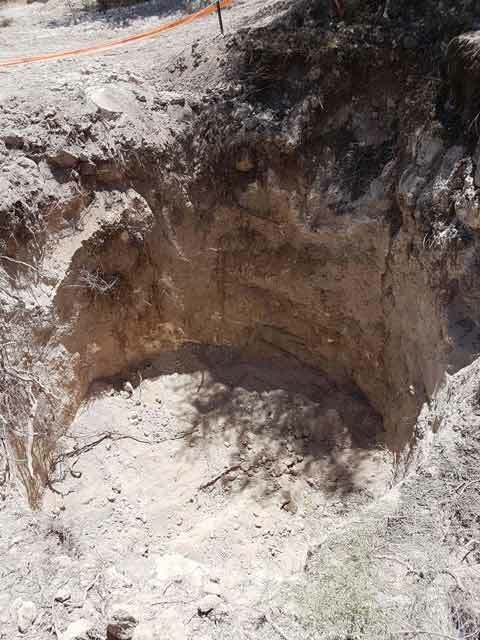 About 6 m southwest of the kiln, a rock-hewn winepress was exposed (Fig. 5). It comprised a treading floor (L12; length 3 m, width 2.5 m, depth 0.3 m) and a collecting vat (L13; length 1.5 m, width 1.2 m, depth 0.8 m). A rectangular niche (L14; length 0.8 m, width 0.4 m, depth 0.25 m) was hewn in the center of the northeast wall of the treading floor, 0.9 m above the floor; it probably served to anchor a pressing beam. Two more finds (Fig. 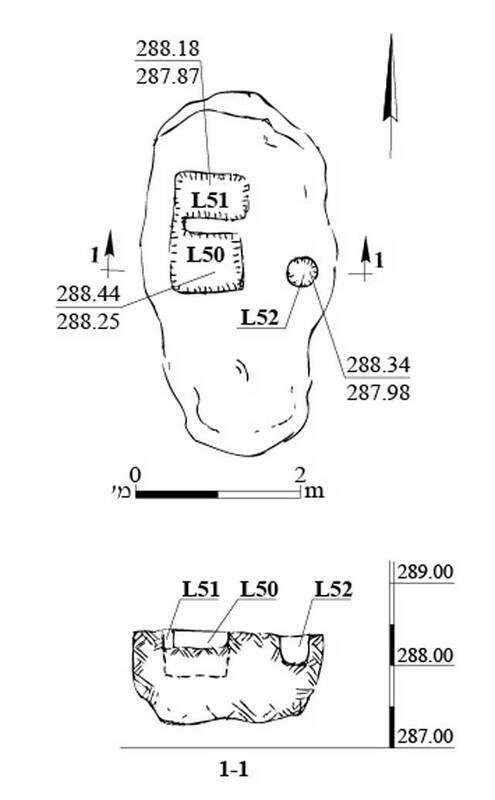 2: Sites 3, 4 [not drawn]) were documented: a circular cupmark cut into a rock surface (diam. 0.35 m, max. depth 0.13 m) and a rock-hewn winepress. The northern part of the winepress had been naturally eroded; its southern part contained a circular treading floor (diam. 1.5 m, depth 0.2 m) and a rectangular collecting vat (length 0.7 m, width 0.6 m, depth 0.4 m). Area B (Fig. 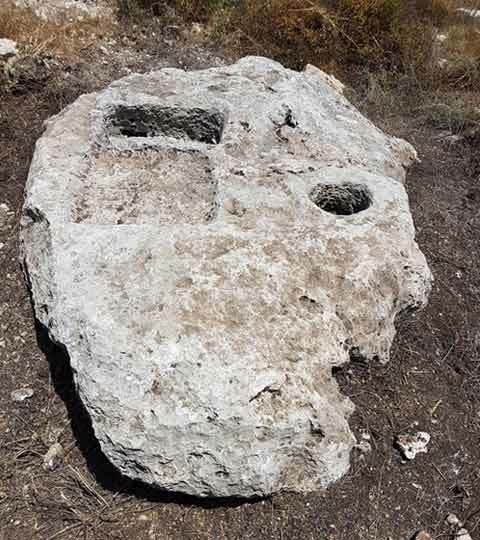 6) yielded a winepress hewn in a rock outcrop: a small treading floor (L50; length 0.9 m, width 0.9 m, depth 0.1 m) and a rectangular collecting vat (L51; length 0.9 m, width 0.6 m, depth 0.4 m) connected by a channel (width 0.1 m, length 0.15 m, depth 0.1 m). A circular cupmark (L52; diam. 0.4 m, depth 0.4 m; Fig. 7) to the east of the treading floor may have served as a stand for a jar. The rock-hewn installations unearthed in the excavation are associated with agricultural and industrial activity in the area. The natural soil that accumulated in the installations was devoid of pottery or any other finds that could date the quarrying and use of the installations. Nevertheless, the plan of the winepress in Area B suggests that it should be linked with the Byzantine complex unearthed nearby (Solimany 2012). Solimany G. 2012. Newe Shalom (East). HA-ESI 124. Storchan B. 2012a. Bet Shemesh, Ramat Bet Shemesh (C). HA-ESI 124. Storchan B. 2013. Newe Shalom. HA-ESI 125. 4. Area A, limekiln, looking east. 5. Area A, winepress, looking east. 6. Area B, plan and section. 7. Area B, winepress, looking north.